Italian Premier Romano Prodi resigned Thursday after losing a risky Senate confidence motion that obliged him to end his 20-month-old government. Early elections or asking a politician to try to form another government are among President Giorgio Napolitano's options as head of state. The center-left government fell four votes short of the 160 needed for victory. The vote was 161-156. 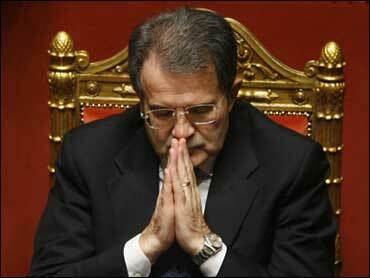 Elected in April 2006, Prodi has had a shaky government from nearly the start. But it lurched toward collapse after a small Christian Democrat party, whose votes were vital to a coalition majority in the Senate, yanked its support earlier this week in the latest squabbling among his allies. Prodi, a 68-year-old former economics professor, went into the vote with the numbers stacked against him after a few additional senators in his coalition said they would cast "no" votes. Napolitano had reportedly asked Prodi to call off the vote and avoid a humiliating defeat, especially in view of the government's victory Wednesday in a confidence vote in the lower Chamber of Deputies. That victory was expected because Prodi's coalition forces in the Chamber have a comfortable majority. In a final appeal for support to senators, Prodi said he insisted on going through with the risky vote not out of "stubbornness but of being consistent." Some of his allies who urged him to go ahead with the vote said that Italians should know which lawmakers contributed to the government's downfall. The Presidential Palace said Napolitano would start consulting Friday with political leaders to help him decide how to proceed.